Sunrise, a promise of a new day. I'm glad I took this shot last Tuesday, which was a good thing. I was planning to do it on Thursday morning but it was raining hard because of a new typhoon. I'm wishing everyone a terrific weekend. Happy sky watching! Thanks for sending me the code of the meme, you´re a sweetheart! 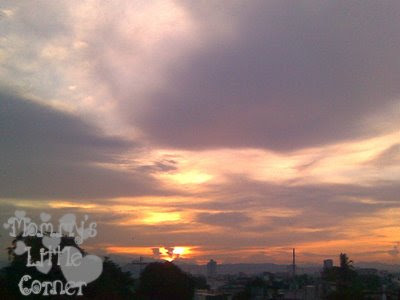 I don't know why but this is the third time I found a blog with sunset picture in it via entrecard. Where is this place by the way? That is a amazing sunset.